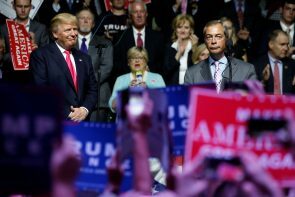 Brexit cheerleader Nigel Farage says Americans may defy the elite by voting for Donald Trump, as Brits did by opting to leave the EU. Farage, like Trump, was loose with facts but accurately gauged public anger. Betting markets, investors and pollsters ought to heed the lessons. The luxury shoemaker’s sales grew 9.2 percent in the first half and operating profitability improved. Its shares still trade at a discount to peers, hit by Brexit worries and exposure to one product. Despite good growth prospects, investors remain reluctant to toe the line. In a normal market, Persimmon’s 36 pct return on capital would get competed away. Instead, sclerotic planning and smaller rivals’ limited access to finance act as barriers to entry. Builders’ fat returns could be vulnerable if the new UK government decides to take bold action. Exports to the UK grew 13.4 pct in July as the weak pound brought bargain-hunting tourists. But globally, shipments continued to slump. Falling, lumpy demand and increasingly mobile customers mean there is little for luxury brands like Swatch and Richemont to set their watch by. Flagging confidence didn’t stop Britons from spending a month after their vote to leave the EU. Consumers may be blind to the recession threat. Or they may be anticipating that a slumping pound will push up the price of imported goods, and pre-empting higher inflation. Gilts’ turbo-charged surge is lifting other debt markets in its wake. Global investors care deeply about wrinkles that might help or hinder UK bonds. High on this list is how easily the Bank of England can buy long-dated gilts as part of its asset purchase programme. The Gulf state's airline has topped up its share in British Airways-owner IAG to 20 pct. The move generates little extra practical benefit, and the rationale is still less than convincing. But the weak pound and a fall in IAG's shares make it a relatively pain-free step to take. The UK prime minister has so far avoided references to the financial sector. The silence may herald industry taxes to plug Brexit-linked revenue losses. But it might not, and UK lenders have less to fear on capital demands, structural separation and interest rates. Investors think the UK will settle easily into a new deal with the European Union. More likely there will be cabinet wrangles, tortuous negotiations with the EU, and an unsatisfactory conclusion. The UK bank has cut back the volume of capital it expects to generate following Britain’s vote to leave the EU. Lloyds is a less risky bank than post-2008. But it is exposed to a domestic slowdown, and its dividend story now looks less compelling. Brussels' ex-financial services tsar is to lead EU talks over Britain's exit. Michel Barnier has at times raised British hackles, but he largely treated the City of London fairly. Arbitration won't be smooth, but the identity of the negotiator could have been worse. A raised 79 bln pound offer for SABMiller should give agitating hedge funds a dignified exit. But it mostly ignores the fall in the value of the Budweiser brewer's offer - and makes a share-based alternative offer targeted at SAB’s biggest shareholders slightly more attractive. Chinese state media have griped that last month's Brexit vote hobbles London's ability to help internationalize the yuan. But there are pluses, too. For one thing, the sterling selloff has made the free-floating democratic pound look a lot less safe next to the steadier renminbi. The UK airline says it doesn’t know what security scares, currency turmoil and Britain’s exit from Europe will do to earnings. The shares have fallen around 30 pct in less than a month. Yet in past downturns easyJet has snatched market share. There’s no reason it can’t again. While the emission scandal's costs are rising, Volkswagen has beaten second quarter operating profit forecasts by a mile. Successful cost cutting and rising sales point to inherent strengths. Yet a new risk looms: a possible slump in car demand due to the shock of Brexit. A new Bank of England report hints at rising prices, risks to investment and delayed hiring plans since Britain voted to leave the EU. Even more worrying, there are reports that demand for loans is easing. This medley of problems wasn't hard to forecast, but is hard to fix. It's easy to think of things Britain might want to keep if it leaves the European Union. But an alternative approach is to work out what aspects it most wants to cast off. That leads to a difficult conclusion: what the UK really wants is what it already has. The UK's Brexit vote threatens London's financial hub-ness, but it would be wrong to think in simple binary terms. Even at worst, the costs to a global bank of staying on in the UK are likely to be counterbalanced by the costs of leaving. And really, it's clients who will decide. A takeover of microchip-designer ARM Holdings by Japan's SoftBank shows Britain is open for business. There is little choice. The UK may need dozens of new trade deals on leaving the European Union. However rare ARM's charms, and whoever the buyer, protectionism isn't an option. Over 80 tragic deaths on Bastille Day at the hands of a truck driver will play into fears about frontier security. The killer's French-Tunisian dual nationality won't deflect that much. With Brexit negotiations and national elections to come, free movement is under threat.